I know, I know, another Tuscan recipe. Well, as I’m sure you know, when you visit a place, you often wish you were back there once you’re home. This feeling can last years. Besides looking through pictures, the way we attempt to return (mentally) to places we vacationed is through food. After receiving a $50-off coupon in the mail for the NYC home-delivery grocer Fresh Direct, I decided to give it a shot. Besides the $10 block of country pate, 12 slices of Serrano Ham for $9 and beautiful fresh loaf of sourdough, we also bought one frozen octopus. We ate ALOT of octopus (pulpo) during our travels both in Italy and Spain and at our local Peruvian restaurant so we figured we could try to make something we’ve eaten before. One thing to note is when you cook octopus it shrinks MAJORLY. Our first thought when we looked at the thawed ‘pus was that we could use it to make three different tapas. After we boiled it we wondered if we could even get one meal out of it! Hmmmm… what to do? We considered making a spicy pasta sauce with it, but I ate pasta three times last week. So we were reminded of the Tuscan favorite, Livornese Fish Stew or il cacciucco all livornese. This rich and hearty meal would brighten up any seafood lover’s cold, dark day. Although it’s not winter, I hope to make this again on a cold night. It was so satisfying without weighing me down. When researching I found that, according to tradition, this soup should contain at least 5 different types of fish – as many as the number of “C’s” in it’s name (love those Italians!). 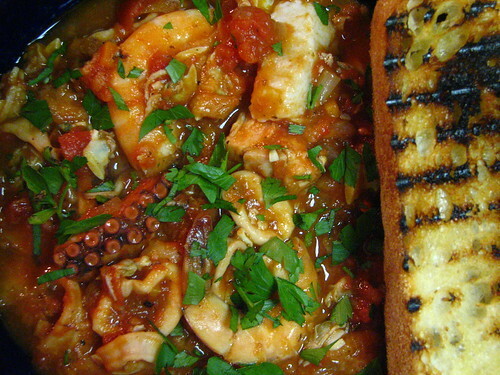 Also, a Livornese Fish Stew utilizes whatever the fish monger has to offer and is in season. Any shellfish (mussles, clams, shrimp etc. 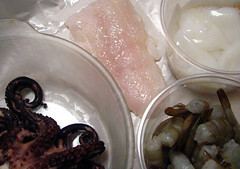 ), white fish (monkfish, dogfish, halibut, bass, catfish, sole, etc.) plus some squid and octopus. Don’t forget the spice – this stew should have a spicy bite to it. Pair it with a crunchy piece of bread and you’ve got a meal in a bowl. Again, traditionally, you are supposed to toast white bread, rub it with garlic and then lay it in the bottom of your soup/stew bowl. Instead, I added a few pieces of white bread to thicken the stew (sort of like we did when we recreated the Pappa al Pomodoro a few weeks ago). Once you’ve bought all the fish, the actual prep work is easy and quick. The only thing I would try and prep early is the octopus. Freezing the octopus actually helps tenderize it, so if you buy it fresh and thawed, ask if it has been frozen previously and, if not, freeze it then thaw it again. 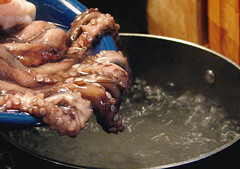 Once this happens, you want to boil the octopus for an hour and 15 minutes in water with a dash of white vinegar in it. This will further tenderize it. Also, we bought canned whole clams for this and they tasted wonderful (although fresh is always better!). Give it a shot, it’s so worth it! Heat the olive oil and saute the carrot, onion and celery until golden and soft. Add the finely chopped garlic and the red pepper and saute for a minute or two. Add your wine and reduce till almost completely absorbed. Add your squid and octopus pieces and saute for one to two minutes. Add the tomatoes, season with salt and pepper and stir. Add the hot fish broth, stir and let your stew simmer for 20 minutes. Lower the heat and add in your stale bread. Push the bread down below the surface of the sauce. Let absorb in the stew for a minute then stir. Increase heat to medium again and add your shrimp, white fish and clams (plus whatever other fish you want to include). After shrimp looks cooked you are done! Test for seasoning and plate up! Sprinkle some chopped parsley and a little bit of extra virgin olive oil on top. Grill a thick piece of bread for the side… Enjoy! nicole’s chef soaks the octopus overnight to tendorize, not sure what he uses, but it is how he gets it so soft and delicious. that looks yummy by the way. Wow. Cooking an entire octopus at home?!?!? Pretty gutsy 🙂 I have a hard time eating anything with tentacles, but this does look pretty amazing. I traveled to Tuscany two years ago and I cannot wait to go back. My favorite meal I had in Italy was in Capri, it was a gnocchi dish in a tomato sauce with zucchini and shrimp. The best part was probably the view. This sounds wonderful, I am a huge fan of octopus. I cannot wait to make this. Well, I am definitely Italian. My mother Aida, and my worthless father immigrated here about 50 years ago. Mom is dead now because she had to work in a sweat shop factory in Brooklyn to support me and my brother after my “father” ran off with a 19-year old floozie. Even though I am a PROFESSIONAL CHEF educated at Peter Kump’s Culinary Institute, a SENIOR ADVISER to SeriouEats website, a BOOK REVIEWER for Amazon.com, and the former wife of a New York City dentist named “Chuck” (he was my fourth husband . . . before he sent me an email requesting a divorce), I just never really liked octopus. 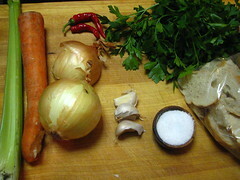 But your recipe for Livornese Fish Stew (il cacciucco alla livornese) sounds SOOoo delicious, I am going to prepare it for my boyfriend “Big Bear” and his buddies down at the shop. Man, I’ve been wanting to try cooking octopus. I used to catch them, fishing in the wintertime in the Gulf of Mexico, but I always threw them back. I’ve loved them in Spain, Mexico, and Costa Rica, but I like what the Japanese do to them in sushi/sashimi. I always wondered how you tenderize octopus. Great tips, and this dish looks delicious! ChiffOnade – I really hope you stop by our blog often! I think you’re my long-lost friend. You sound like you’ve had quite a life so far and I would put some money down that you’d write a hell of a book! Please stop by again, we could use more of your great comments. PeterM: TOTALLY try some octopus! I think it scares people to consider cooking, but to me, grilled octopus is one of the tastiest treats ever. But you’re right on with how the Japanese do them. But the Spanish, whoa… they do it best in my books. Thanks so much for stopping by – please come back again. Let us know if you ever cook that octopus! marc – thanks for visiting an old post of ours. this was a tasty dish and if i inspired anyone to give octopus a try… i feel good. have a great weekend all! Oh man, I really got to try cooking a whole octopus! It just looks so cool. Where did you find your frozen octopus? Was it in an ethnic grocery or just a normal one like Safeway?